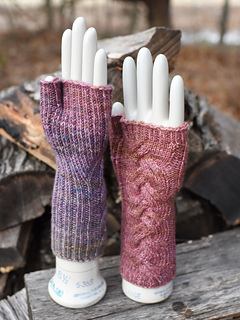 This is a companion to Imply, and you can buy both patterns together for a discount. 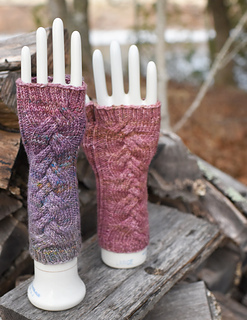 The price for the set is $11.40 (that’s a savings of $3.50 off the price of the individual patterns). If you put both patterns in your cart together, you’ll see the price reduced to $11.40 (you don’t need a code, it happens automatically). And don’t worry! 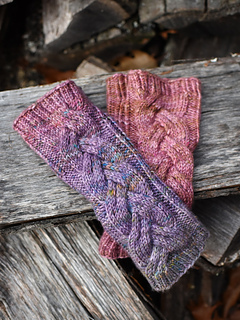 If you’ve already bought Imply, whatever you spent on it will be counted towards the price of the set (as long as you’re logged into your ravelry account when you make both purchases). So if I’m going to do a cable, I want to really do a cable. Commit. Go big. Embrace the drama. But once in a while, that approach can be a little tricky. Big cables sometimes come with big headaches. It can be cumbersome to manipulate all those stitches, and giant cables can make your fabric bunch up in all sorts of irritating ways. But we’re knitters…we’re clever…we can fix it! The way these cables are built is really nifty. The cable panel is big (a full 18 stitches wide). But instead of making huge cable crosses, you do a bunch of carefully placed smaller crosses (it’s all based on three over three cables…really!) that combine to give you all the drama and none of the headaches. 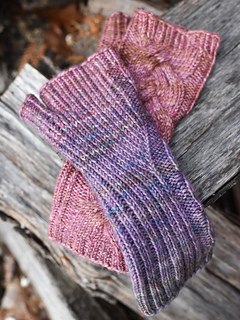 It’s a fun technique, and one that lends itself to lots of other projects (so fun I had to do it twice…I cast these mitts on just after I finished a hat using the same cable). 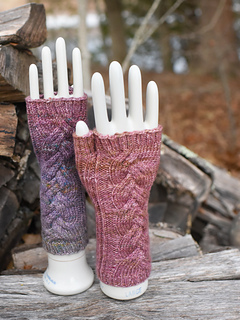 The mitt is written in four sizes (castons of 36, 39, 42, and 45 stitches), and you should feel free to adjust your gauge a bit to fine tune the fit of the mitt. 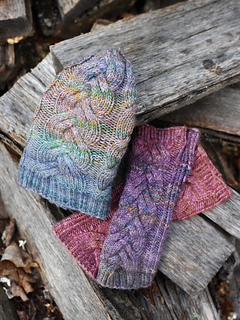 Just be sure that you’re working at a gauge that gives you a fabric you like with your chosen yarn! I recommend working at something around 5.5, 6, 6.5, or 7 stitches per inch, and I’ve included a table to help you figure out what gauge you’ll want to use for your size. With that range of sizes and gauges, the hat will fit a wrist between 5.75 and 9 inches (with lots of points in between). The hat in the picture down at the bottom is Imply, the companion to this piece. You can get both pieces together for a discount, check out the top of the page for more info.